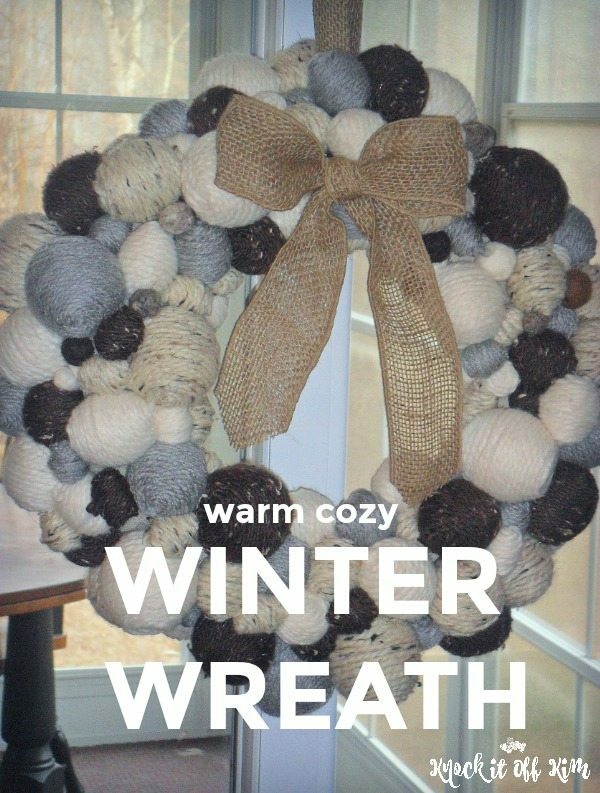 A cozy winter wreath is a perfect way to welcome your winter guests. Perk up your home’s entrance with this winter wreath made from balls of yarn. All the glitz and sparkle of Christmas has been put away for another a year, and winter has fully set in. Ahh.. January. My least favorite month of the year. I’m desperate for something to make me giggle and smile. So is my front porch – it’s been looking a little bleak, what with this crazy cold weather we’ve been having. A front door pick-me-up was desperately needed to get me through January, as my go-to Fall Wreath is a little out of season. Although I’d prefer to be hanging a bit of spring on the door or celebrating summers arrival, that obviously wasn’t going to work either. I needed something new. This one is time-consuming, but it’s worth it. It reminds me of a warm hug or a pile of snowballs – If they were warm! Cover the wreath form with coordinating scrap fabric, by wrapping it, and attach a length of burlap ribbon at the top for hanging. Begin creating the balls. It is easiest to wrap each ball one half at a time. Begin by dabbing glue on the top of the ball and winding the yarn in a spiral beginning at the top until you reach the middle of the ball. Cut the yarn and glue the end. Turn over the ball and wrap the yarn, meeting up with the cut end in the middle. Repeat. I found it easiest to create a dozen balls of each size and then to make whatever I needed to fill in the wreath as I went along. 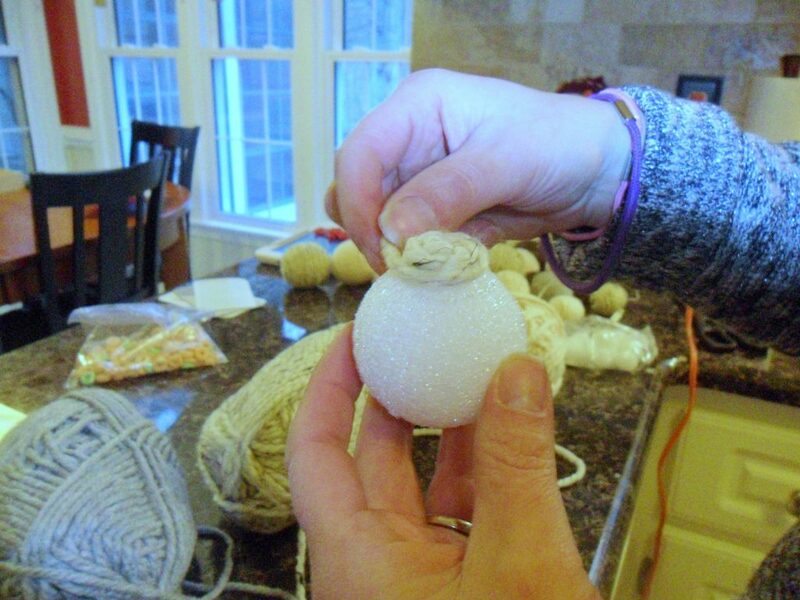 Begin attaching the balls to the form, starting with the largest balls and spacing them out. Repeat this for each ball size until you’ve used two dozen per size. Create balls in various sizes to fill in the gaps. 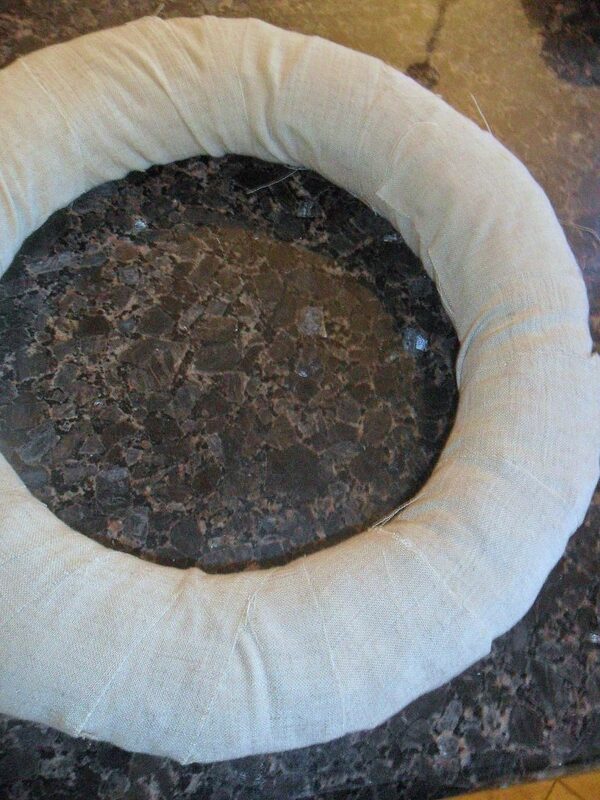 To finish, add a decorative burlap bow. In closing, I had no idea how difficult it would be to write an entire post about balls and not say anything derogatory since I’m ten years old inside. In truth, it turns out it’s impossible – if you’re easily offended, I recommend you stop reading now. The ten-year-old in me is fighting to get out, and I can’t hold back any longer. With that said, after creating this wreath, I have big and small balls. If you make this wreath as well, we’ll all have big and small balls. Balls to the walls. There. I feel so much better, and I’ll be laughing my way through all of January, every time I look at my front door! Haha! I love this, I've been looking for a wintery wreath, this is so unique and cute. Great idea! Thanks lady! Hope to see you soon! Kim, your big and small ball wreath looks adorable! I like it much better than the all felted one. Also, having a ten year old inside eager to come out was not bad at all. Ten year olds are still innocent and funny. Thankful that a dirty old man wasn't lurking around, lol! Thanks so much, Gail! Coming from you.. the maker of that incredibly gorgeous burlap wreath with the bendable flowers that I've been in love with for forever.. that is a huge compliment! 🙂 Yes, luckily there wasn't a dirty old man around, although, I'm starting to think maybe I have one trapped inside of me along with the 10-year old! Oh, heavens! This is so cute! I might just have to make one of these… 😉 Thanks so much for the inspiration, and for stopping by Stringtown Home! Hope your weekend is going well! Thanks so much, Heather! Well.. if you do.. you know what that means! haha. And thanks for stopping by.. I hope to see you again! I crochet & knit and always have leftover yarn – this would be great to use it up making this cute wreath. Thanks for the tutorial. I also have some of those foam balls from a project I did with my kids a long time ago. Can't wait to make one – maybe my boys would like to help since they like to use the glue gun. What a great idea, Kimberlee! I wish I'd made the wreath when my girls were home.. they'd have loved it and I would have probably figured out what was taking me so long much earlier in the process! Thanks for stopping by and I'd love to see your finished wreath if you do make it! I love it! I love the natural colors, it gives it a rustic feel. Thanks so much, Bethany! For the compliment and for stopping by! What a lovely wreath! I like the yarns you used. I'm pinning this! I love the colors and yarn textures in your wreath! Perfect for winter!! Thank you so much for linking up at Share it Sunday! !